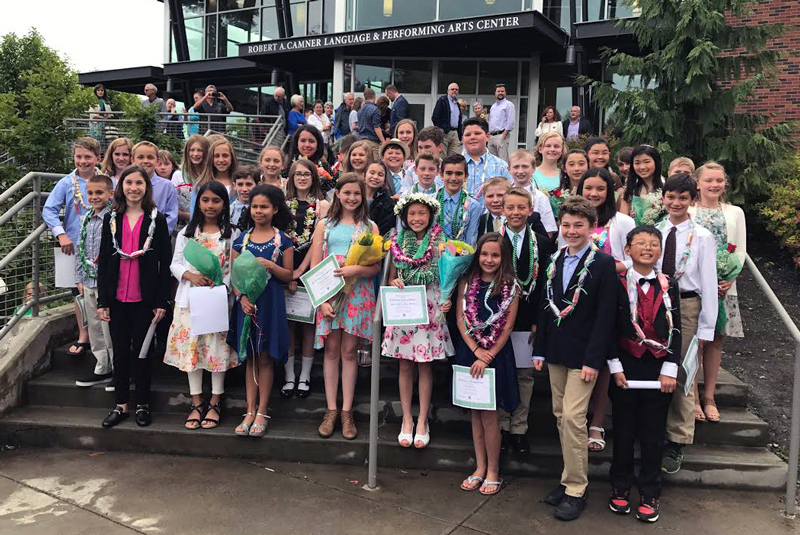 Tacoma, Wash. – Charles Wright’s Class of 2024 celebrated the culmination of their Lower School education on Friday, June 9, with a fifth grade moving-on ceremony in the Donn Laughlin Theater in the Robert A. Camner Language and Performing Arts Center on campus. Forty-six students were honored in front of family, friends, and faculty for their kindness, sense of humor, and collective supportive nature. A photo slide show featuring portraits of each student taken by second grade teacher Kevin Hong was on display prior to the ceremony’s start. After an invocation by outgoing Chaplain Mike Moffitt; words of welcome from Head of School Matt Culberson and Head of Lower School Diane Hunt; and words for the journey by fifth grade teachers Helen Bingham-Rowles, Jon Flies, and Shell Malfet, the student choir performed “Lift Every Voice and Sing” and “One Little Candle” with Lower School music teacher Judy Herrington and then treated the audience to a traditional African praise poem, in which each student shared an aspect of his or her heritage, unique qualities, or emotions. Congratulations, Class of 2024! We look forward to seeing you in the halls of the Middle School this fall. Below are photos from the ceremony by Jasper Xin ’18.